Important: Restart application pool after setting/changing the password. Important: If IIS is a different server, install DbDefence Configurator and Client DLL on that server. There is an alternative method to unlock the access to the database. You may allow access to the encrypted database for certain SQL Server logins. Like any other client applications web applications are also affected by access restrictions (if you restrict access). You also need to run unlocking SQL statement to unlock access. To simplify that process DbDefence includes special module that intercepts all database connections from IIS process. It executes unlocking statement before any other SQL commands from web application. By default all applications run in DefaultAppPool, you may set passwords for default pool; however for better security we recommend you to make a copy of default pool and assign this pool to certain applications using encrypted database. 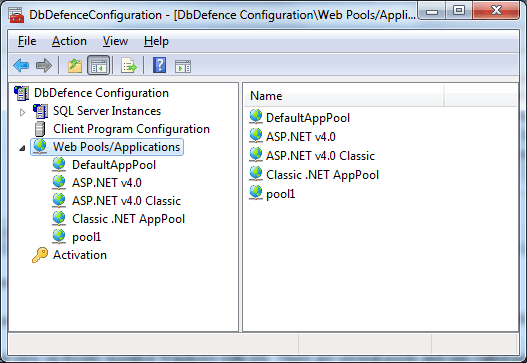 You can create pools with IIS Manager. So, in our case pool1 is just a copy of default pool. Now we simply enter the name of protected database and its password and press "Save". 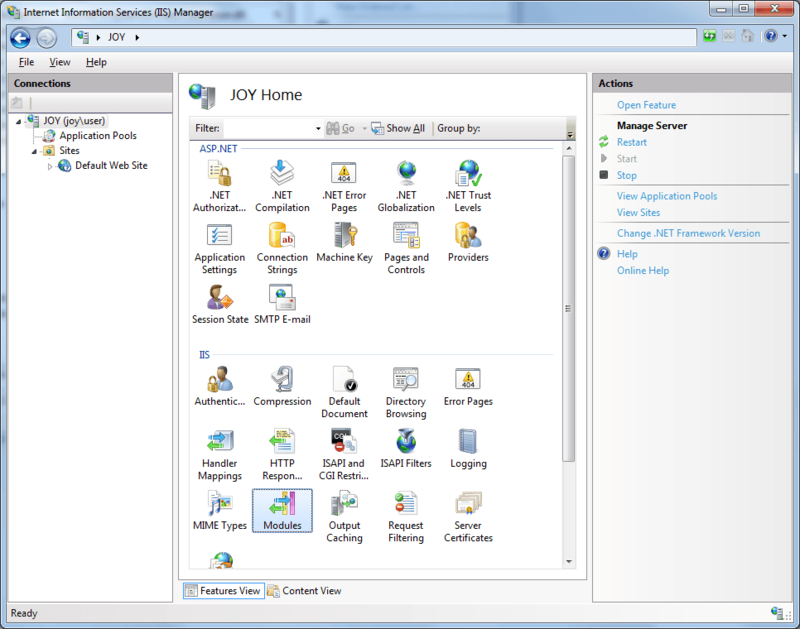 You need to restart your web application with IIS Manager to changes take effect. There are very small performance degradation because for every connection DbDefence module needs to check if there are encrypted databases with the given name or not. Luckily IIS uses connection pooling, so those checking don't happen too often. So actually you will not notice any performance degradation. Passwords securely encrypted and stored on the server. It is not transferable to another server and can't be recovered (in reasonable amount of time). Web application can't read and display password like it is possible with Microsoft Secure Configuration. 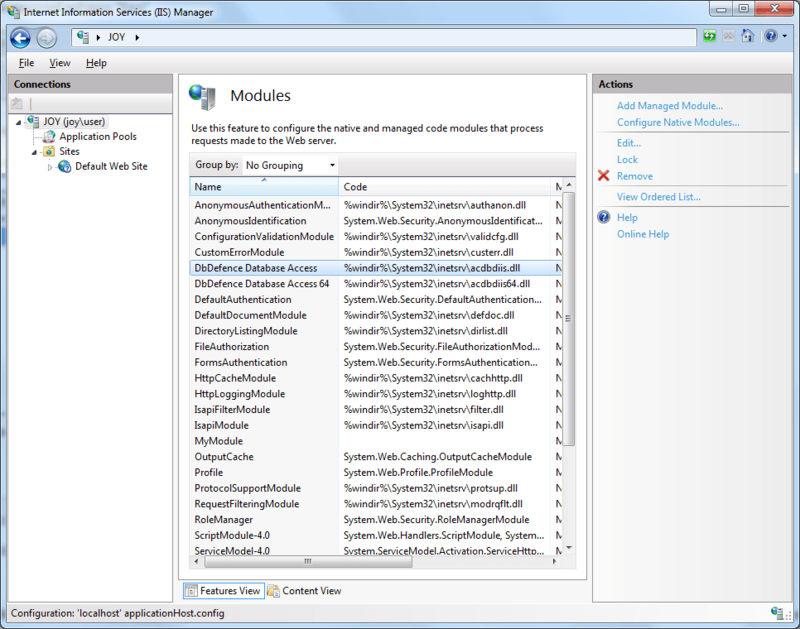 As you see there are different DLLs for 32 and 64 bit applications. To remove the module do not just delete files! It will lead to "Service Unavailable" error. c:\windows\system32\inetsrv\appcmd uninstall module "DbDefence Database Access"
c:\windows\system32\inetsrv\appcmd uninstall module "DbDefence Database Access 64"
If there is a problem with the module, your application get Service Unavailable error and pool is stopped. Take a look in Event Log to find the problem. Installer does not automatically install required modules. DbDefence supplies 2 ISAPI filters acdbdiis.dll and acdbdiis64.dll for 32 and 64-bit OS. Those files are copied into %WIN%\SYSTEM32\INETSRV. You need to install appropriate ISAPI filter manually depending on your OS platform. Setup passwords as usually with the Configurator GUI. 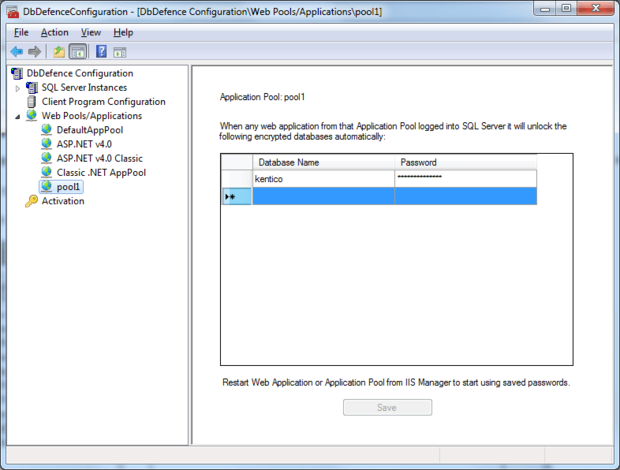 Restart target application pool in IIS Manager after setting passwords.